Building on a series of recentbreakthroughs in silicon photonics, researchers at the UCLA Henry Samueli School of Engineering and Applied Science havedeveloped a novel approach to silicon devices that combines light amplificationwith a photovoltaic – or solar panel – effect. In a study to be presentedtoday at the 2006 International Optical Amplifiers and Applications Conferencein Vancouver, Canada, UCLA Engineeringresearchers report that not only can optical amplification in silicon beachieved with zero power consumption, but power can now be generated in theprocess. The team's research shows thatsilicon Raman amplifiers possess nonlinear photovoltaic properties, aphenomenon related to power generation in solar cells. In 2004, the same group at UCLA Engineeringdemonstrated the first silicon laser, a device that took advantage of Ramanamplification. "After dominating theelectronics industry for decades, silicon is now on the verge of becoming thematerial of choice for the photonics industry, the traditional stronghold oftoday's semiconductors," said Bahram Jalali,the UCLA Engineering professor who led researcherSasan Fathpour and graduate student Kevin Tsia in making the recent discovery. The amount of information thatcan be sent through an optical wire is directly related to the intensity of thelight. In order to perform some of thekey functions in optical networking – such as amplification, wavelengthconversion, and optical switching – silicon must be illuminated with highintensity light to take advantage of its nonlinear properties. One example isthe Raman effect, a phenomenon that occurs at high optical intensities and isbehind many recent breakthroughs in silicon photonics, including the firstoptical amplifiers and lasers made in silicon. The fundamental challenge insilicon photonics is the material stops beingtransparent at high optical intensities, making light unable to pass through. "As light intensifies insilicon, it generates electrons through a process called two-photon-absorption.Excess electrons absorb the light and turn it into heat. Not only is the lightand the data-carrying capacity lost, the phenomenon exacerbates one of the mainobstacles in the semiconductor industry, which is excessive heating of chips.The optical loss also makes it all but impossible to create optical amplifiersand lasers that operate continuously," Jalali explained. In previous attempts to deal withthis challenge, a diode attached to the chip has been used to "vacuum" out theelectrons which block light. This approach presents further problems, however, becausethe vacuum adds an additional watt of heat onto the chip – nearly a milliontimes the power that a single transistor consumes in a digital circuit. "In the past,two-photon absorption in silicon has resulted in significant loss for highpower Raman amplifiers and lasers, reducing efficiency and necessitatingcomplex mitigation schemes. UCLAEngineering's new development will enable recycling power that would otherwisebe lost. In space and military lasersystems, the impact of device efficiency on electrical power and thermalmanagement is a prime consideration," said Dr. Robert R. Rice, senior scientistat Northrop Grumman Space Technology's Laser and Sensor Product Center. Thechallenge of power dissipation in traditional silicon semiconductors already isso severe that it threatens to halt the continued advance of the technology describedby Moore's law. Because the UCLA Engineering team's discovery creates an advantagein heat dissipation, it represents a new perspective. "The progress insilicon Raman lasers at UCLA Engineering by professor Bahram Jalali and his group has been very impressive, not onlyoffering obvious benefits in photonic systems, but also opening up an entirelynew approach," Rice added. "This discovery is a step forward and makes it much more likelythat the photonics and electronics will converge. If they do, many applications that siliconphotonics has promised will come to fruition," Jalali said. Silicon photonics technology has the potential to use the power ofoptical networking inside computers and to create new generation ofminiaturized and low-cost photonic components, among other applications. Jalali's research at UCLAEngineering has been funded by the U.S. Department of Defense through theDefense Advanced Research Project Agency (DARPA). The research was also co-sponsoredby the Northrop Grumman Corporation. Establishedin 1945, the UCLA Henry Samueli Schoolof Engineering and Applied Science offers 28 academic and professionaldegree programs, including an interdepartmental graduate degree program inbiomedical engineering. Ranked among the top 10 engineering schools amongpublic universities nationwide, the school is home to six multimillion-dollarinterdisciplinary research centers in space exploration, wireless sensorsystems, nanotechnology, nanomanufacturing and nanoelectronics, all funded byfederal and private agencies. For moreinformation, visit http://www.engineer.ucla.edu/. 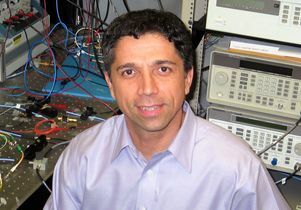 Bahram Jalali, professor of electrical and computer engineering in the UCLA Samueli School of Engineering.